The great dome of the Sanctuario della Santa Casa dominates the countryside for miles around; below it stands the focus of piety - the rustic cottage from Nazareth that witnessed the Annunciation and the childhood of Jesus (see the tradition of the Holy House below). The result is a showcase of work by many of the most celebrated names of late Renaissance Italy and gives even the unbeliever good reason to come here. 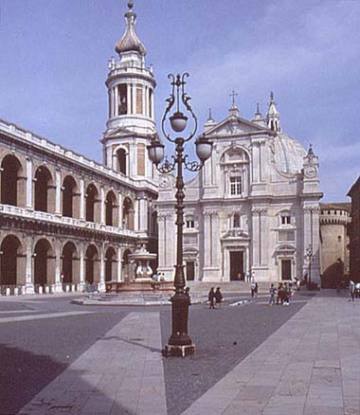 Started on gothic lines, later architects including Bramante and Sansovino gave the church a thorough late Renaissance treatment. Inside, under the dome, is the great marble facing that protects the Holy House, carried out in the 16thC to Bramante's designs by the celebrated medal-designer Gian Cristoforo Romano, Andrea Sansovino and Antonio da Sangallo the Younger. Note how around its base centuries of kneeling pilgrims have worn furrows in the marble. The curious statue within the walls of the Santa Casa of the black Madonna of Loreto is a modern copy of the original destroyed in a fire in 1921; some claim that the tradition of the black madonnas to be found in many famous shrines is a reference to the prophetic line referring to Mary in the Song of Solomon, "I am black, but comely"; others more prosaically point out that the statues were often carved in dark hardwoods, later further blackened by the smoke of votive candles. At the bottom of the right nave are the church's greatest artistic treasurers - gem-stone coloured frescoes in the Sacristy of St Mark by Melozzo da Forli', and Luca Signorelli's noble frescoes in the nearby Sacristy of St John. Piazza della Madonna, the elegant set-piece square with a delicate baroque fountain that fronts the Sanctuary is flanked on two sides by the arcades of the 16thC Palazzo Apostolico. The Museo-Pinacoteca inside preserves a fine group of late works by Lorenzo Lotto (the Venetian master retired and died in the monastery here in 1556) and an unusual collection of Renaissance ceramic pharmacist's jars. Hidden away in a corner are also some 70 carved blocks of box-wood used until the 1940's to stamp designs on pilgrims bodies which were then indelibly tattooed as permanent souvenirs of their pilgrimage to Loreto. It first arrived on a hill in Dalmatia. Here it stayed until the 10th of December 1294, when it was again miraculously moved, this time across the Adriatic Sea to a laurel grove (Latin lauretum, hence Loreto) infested - as such places always are - by bandits . To this day the marchigiani light large bonfires on the eve of the 10th of December, the Feast of the Translation of the Holy House, to help the Santa Casa on its way.